Just a few blocks from downtown Livingston and Sacajawea Park. 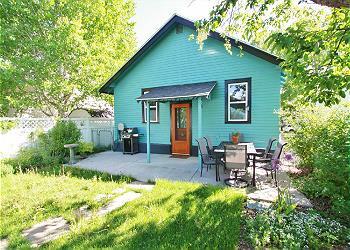 Renovated historic bungalow with a fenced, beautifully landscaped backyard. Wireless Internet and Satellite TV. BRIEF DESCRIPTION: This two+ bedroom bungalow has been renovated and decorated in keeping with the historic charm of the neighborhood. On a quiet side street, it is just a couple of short blocks from downtown Livingston where you can find a variety of shopping and dining options. Livingston will remind you of Main Street USA – clean quiet streets lined with charming renovated historic homes, tidy well landscaped yards and sidewalks. BEDROOMS AND BATHS: Hagen House has two bedrooms on the main floor and a day light basement with a twin daybed with twin trundle. Both bedrooms on the main floor have queen beds, original oak flooring, vintage wood doors and handles, elegant modern bedding and closets. There is a renovated full hall bath with a clawfoot tub/shower and a pedestal sink. 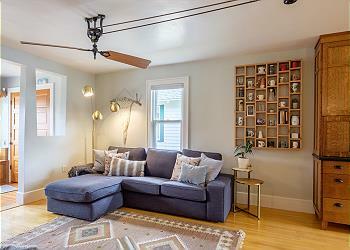 The newly refinished daylight basement has a twin daybed with a twin trundle as well as a private full bath with pedestal sink and tub/shower. KITCHEN: This completely renovated and fully equipped kitchen has everything you will need for any meal you have planned. There is a nice selection of cookware, serving ware and a good spice cabinet. The kitchen features new Shaker style cabinets, honed black granite countertops, standalone butcher block island and new appliances including a retro style look fridge by Big Chill, Samsung 5-burner gas range, dishwasher and microwave. DINING AREA: The dining area is open to the kitchen and living room. A built-in bench forms two sides of the seating and there are three other chairs for a total of six. 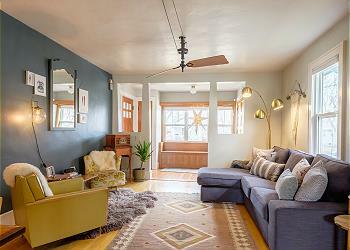 LIVING ROOM: Decorated with a mid-century vibe, the new sofa has a lounger section, two vintage chairs and mod lighting. The adjacent entry hall has a long bench for taking off your shoes and storing your gear. 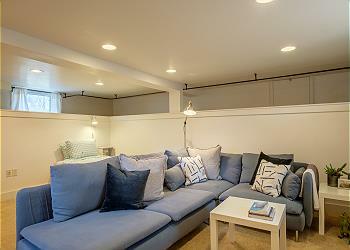 DAYLIGHT BASEMENT FAMILY ROOM: The new daylight basement offers an extra space for everyone to hang out and watch TV while sitting on the sectional sofa. Huge Samsung flat screen TV, speaker with phone connectivity, games, books and puzzles complete the entertainment options. 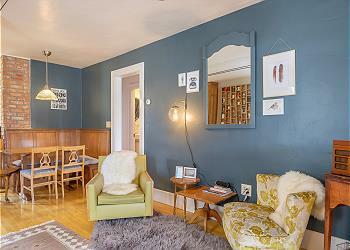 This room also has an adorable window seat for the kids, the twin daybed with twin trundle and the full bathroom. Laundry room with stackable washer / dryer is adjacent to this room. 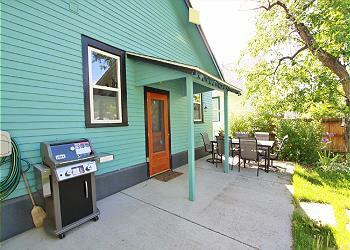 SETTING, ACREAGE, AND VIEWS: Just a short walk to downtown Livingston, Sacagawea Park and the Yellowstone River. OUTDOOR AMENITIES:The home has a fully fenced backyard with beautiful landscaping. Gas grill plus outdoor dining table with six chairs on the covered patio off the kitchen. CLOSEST AIRPORT: It is about 30 minutes to Bozeman's Yellowstone International airport. ACTIVITIES NEARBY: Walk to downtown to browse the galleries and shops and sample the great dining available. Outdoor recreation of all sorts is just a short drive away … try whitewater rafting, horseback riding, hiking, biking, or fishing. Yellowstone National Park is just an hour away. There is so much to do!